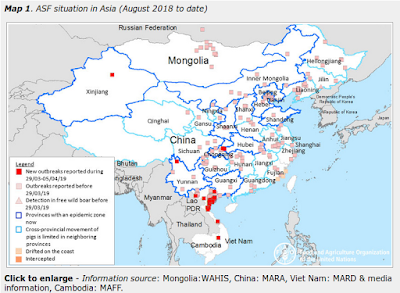 Much like Chikungunya, the Zika Virus moved out of Africa in the middle of the last decade and began to spread across Asia and the South Pacific. Both arrived in the Americas within months of each other roughly two years ago. Of the two, Chikungunya has caused the greatest impact by far, but Zika is rapidly making inroads into South and Central America. Both have been described as being `milder’ than Dengue, self-limiting, and rarely fatal. But over time those traits are being re-evaluated as more data comes in. Over the weekend the journal Neurology published a study called Chikungunya virus–associated encephalitis: A cohort study on La Réunion Island, 2005–2009 by Patrick Gérardin, MD, PhD et al. that found that CHIKV was a significant cause of CNS disease, with the very young children and the elderly at greatest risk. Zika, until recently, was considered even less of a health threat than Chikungunya, but after the outbreak in French Polynesia a year ago we saw a significant spike Guillain–Barré syndrome (GBS). Add in a surge in birth defects in Brazil that began months after Zika arrived there - along with an increase in GBS – and now this mosquito borne virus is also coming under new scrutiny. Over the past few days additional data has emerged suggesting a (smaller) spike in birth defects in French Polynesia following their recent outbreak (see Post-Zika Outbreak Spike In Congenital Abnormalities In Brazil & French Polynesia). All of which brings us to the following epidemiological update from the ECDC. After you return I’ll have a bit more about where this virus might turn up next. Zika virus infections are still spreading in previously unaffected areas of the world. Since 2014, indigenous circulation of Zika virus (ZIKV) has been detected in the Americas. As of week 47, November 2015, autochthonous cases have been reported by WHO in Brazil, Colombia, Suriname, El Salvador and Guatemala . According to media quoting the national authorities, on 26 November, the first two indigenous cases of ZIKV infection were confirmed in Mexico, one in Chiapas and the second in Nuevo Leon . Autochthonous cases have also been reported from Cape Verde, the Republic of Fiji, the Republic of Vanuatu, Samoa, the French territory of New Caledonia, the Solomon Islands and Indonesia in 2015 [3-5]. On 11 November 2015, the Brazilian Ministry of Health declared a public health emergency in relation to an unusual increase in the number of children born with microcephaly in Pernambuco state during 2015 . An increase of microcephaly was also reported in the states of Paraíba and Rio Grande do Norte. On 17 November 2015, the Brazilian Ministry of Health reported the confirmation by RT-PCR of the presence of ZIKV RNA in amniotic fluid samples collected from two pregnant women with foetal microcephaly from the state of Paraíba . Both pregnant women presented compatible symptoms of ZIKV infection during their pregnancy. The significance of this finding is still under investigation. On 17 November 2015, the Pan American Health Organization/World Health Organization (PAHO/WHO) issued an epidemiological alert regarding the increase in microcephaly in the north east of Brazil. WHO Member States were requested to remain alert to the occurrence of similar events in their territories and to notify any occurrences through the channels established under the International Health Regulations (IHR) . As of 21 November 2015, 739 suspected cases of microcephaly have been identified in 160 municipalities across nine states of Brazil. Pernambuco state has reported the highest number of cases (487) followed by the states of Paraíba (96), Sergipe (54), Rio Grande do Norte (47), Piauí (27), Alagoas (10), Ceará (9), Bahia (8) and Goiás (1) . On 25 November 2015, media quoting the Flavivirus Laboratory at the Oswaldo Cruz Institute reported that seven cases of Guillain–Barré syndrome (GBS) had been linked to ZIKV cases in Pernambuco state . The number of cases of GBS increased significantly in the north east of the country between April and June 2015, shortly after the ZIKV epidemic started. 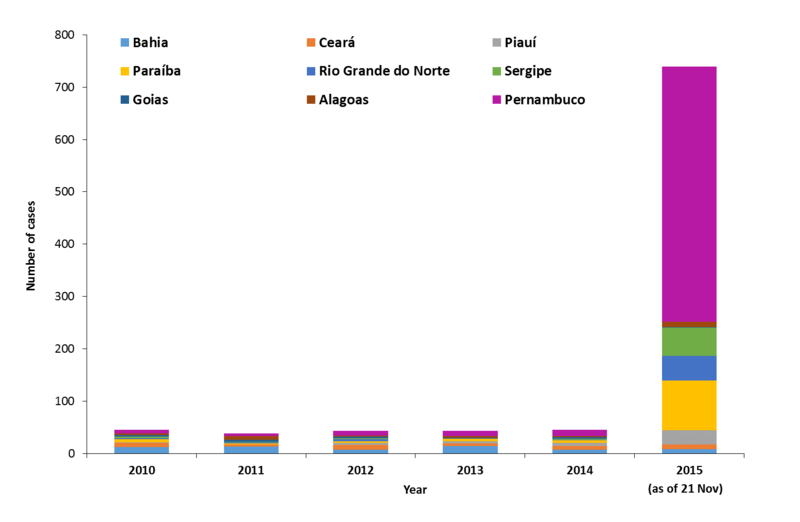 According to media, an increase in GBS has been observed in several states across Brazil, with 24 cases in Rio Grande do Norte state between April and June 2015, four times more than the historical average . There have also been increases in Pernambuco (130 cases), Bahia (55 cases), Maranhão (14 cases) and Paraíba (6 cases) states . Investigations are on-going regarding a possible association with ZIKV infection. An increase in central nervous system malformations in foetuses and newborns has also been reported in French Polynesia following an epidemic of ZIKV infection in 2013–2014. The potential link between microcephaly and the Zika virus epidemic is addressed in ECDC’s Rapid Risk Assessment dated 24 November 2015 . Although it isn’t yet official, there are media reports of Zika in Mexico. Much of Central & South America, along with the Caribbean are at risk. Included also are parts of North America where the two primary Aedes mosquito vectors can be found. The Aedes Aegypti mosquito is pretty much limited to the Gulf Coast states, but the rapidly expanding range of the Aedes Albopictus mosquito (see below) covers pretty much the eastern half of the nation. These mosquitoes can carry Dengue, Chikungunya, Zika and other diseases. Despite repeated introductions we’ve yet to see either Dengue or Chikungunya establish themselves in North America. In 2003, a CDC EID study suggested that economics and lifestyle may help mitigate locally transmitted Dengue (see Texas Lifestyle Limits Transmission of Dengue Virus), but how long our luck will hold is unknown. Taking note of this threat, last May the CDC held a Grand Rounds presentation to bring clinicians up to date on the Aedes mosquito threat, which is archived and available for viewing (see Grand Rounds: Preventing Aedes Mosquito-Borne Diseases).